At SMEC we’re fortunate to have the opportunity to positively impact the individuals and communities we work with. Our Corporate Social Responsibility framework reflects our values and how we aim to conduct our daily work, with our three focus areas being People, Community, and Sustainability and Environment. People are the core of our business and our purpose - to improve lives and shape cities and communities around the world. Safety is a key priority within the People pillar, achieved through ensuring we provide safe and healthy working conditions for our employees, contractors, visitors and the general public. We have implemented policies and procedures to measure progress towards our zero harm objectives and increase safety awareness. We are committed to operating in a manner which promotes community engagement and sustainability, and actively engage in community development through the SMEC Foundation. The SMEC Foundation operates with the philosophy that a small amount of money spent wisely can produce far-reaching social and economic benefits. Through the adoption of a localisation model, we invest in local operations and nurture local talent. This increases the skill level of employees in the communities in which we operate and increases SMEC’s local capacity to deliver projects. At SMEC, we are committed to embedding sustainability principles throughout the business. We strive to undertake all project and office activities in an environmentally responsible manner, and to identify, manage and mitigate any risks that may impact negatively on the environment. 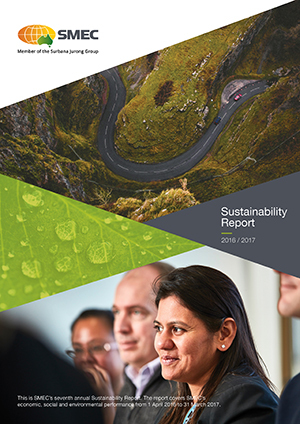 We continue to improve our understanding of the sources, scope and extent of our resource use, and are committed to improving the energy efficiency of our offices, and reducing the Greenhouse Gas (GHG) emissions generated by SMEC’s operations.